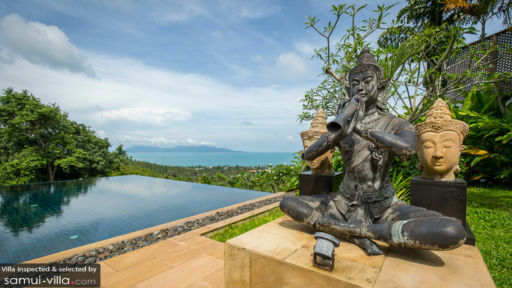 A splendid Thai-Balinese holiday home overlooking the ocean in Bophut hills, Samui, Ban Kinaree is a tropical paradise complete with an infinity swimming pool with stunning views. Perfect for large groups of people, the villa is designed with three distinct pavilions housing the five bedrooms, living/dining spaces, and the fully-equipped kitchen. The villa provides a safe haven for guests where you can enjoy to the fullest and bask in the serene natural ambiance with friends and family. Bophut beach is home to many an interesting sight including Big Buddha and the historical and popular destination of Fisherman’s Village is also close by! The five, well-furnished bedrooms at Ban Kinaree are spread across the three pavilions at the villa thus, providing ample privacy and a personal space to each and every guest. One bedroom is housed individually in the smallest pavilion, while two are situated in the main living pavilion. The third pavilion is home to the master bedroom and another bedroom on its ground floor. Each bedroom is air-conditioned and furnished with a king beds and twin bed for a good night’s sleep. There are large windows or sliding doors that lead to either the terrace or gardens. The bedrooms are quite spacious and also host a number of seating options. En-suite bathrooms make it all the more convenient complete with showers and some with a Jacuzzi bathtub! Outside with a panoramic vista that spans across verdant tropical land, sandy shores, and the endless ocean, there is the villa’s 19-metre swimming pool that sits majestically right at the edge sporting an infinity-style layout. While you splash and wade with style, enjoy a heady view of the neighbouring areas for a wonderful and enriching experience. There are sun chairs on the pool deck just asking to be used for a comfortable nap post-swim. A traditional Thai sala in the corner provides excellent views and a cosy space you can retreat to for some alone time! Nestled in the biggest of the three pavilions is the lavish living room at Ban Kinaree, designed to impress with a lived-in vibe, warm woody interiors, and comfortable furniture. Opening out to the pool deck and beyond that showcasing an even better view, the living room is the ideal meeting place for everyone at the villa. While you wine and dine, you can take in the breathtaking view and relish the fresh, tropical breeze that blows in through the open doors. A high-pitched signature Thai ceiling allows for more ventilation and add a traditional accent to the space. With antiques and sculptures decorating the room, the living room is at once homely and inviting. There is an eight-ten seater dining table in the corner, also offering beautiful vistas, great for feasts with everyone. The fully-equipped kitchen is where all the magic happens as it is fitted with modern amenities and appliances for your use. You can either book the services of a personal chef or get cooking to showcase your own culinary expertise, a choice left entirely up to you! With housekeeping and personal guest assistance in place you can rest easy knowing that all your needs will be met timely and properly. The friendly staff will make sure you have a wonderful stay and even cater to some special requests like massages, transportation, and meal preparation however, these are provided at an additional cost. The villa is conveniently located near Bophut beach and puts you close to a lot of the major attractions in Samui including Fisherman’s Village and the popular Choeng Mon beach. Here you will find hordes of beachside restaurants brimming with friendly faces for a nice meal. Baan Kinaree was quite simply above our very high expectations. we expected an exceptional view, 5 star rooms, a huge infinity pool and a high level of pleasant service all of which was exceeded so thats really saying something....!! A very special experience in a quiet yet stunning setting with views of Ko Phang Ngan wihc made i feel very special indeed. 10 out of 10 thak you luxury villas and homes!! Service was exceptional, we were extremely pleased with the staff and service. 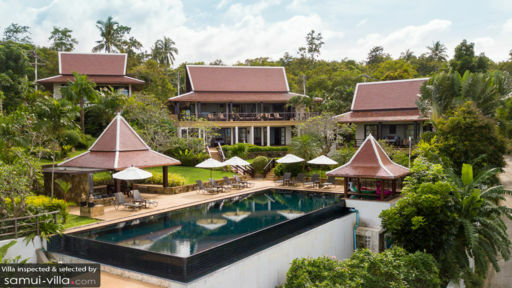 Excellent place to stay for families or groups who want to relax and enjoy a Thai style holidays. 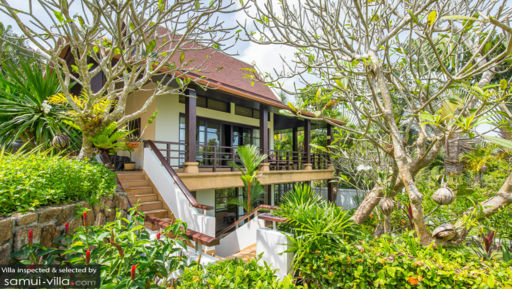 The classic Thai style villa is relaxing and makes you feel at home and on holiday as soon as you arrive. We found the Thai staff helping our needs and giving you space at ease. Great place to stay in style. We had a wonderful time in a stunning villa which really reminds you that you are in Thailand. Classic Thai style architecture. All of the bedrooms are very private and the views are stunning from every room, even the pool!! It would be impossible not to relax here.